Lots of people asking about the polish that I’m wearing in the Teen Skincare Guide video; it’s Lillibet’s Jubilee from Butter London. Not a shade I would usually go for, admittedly, but I wanted to jazz up my very boring outfit that day! 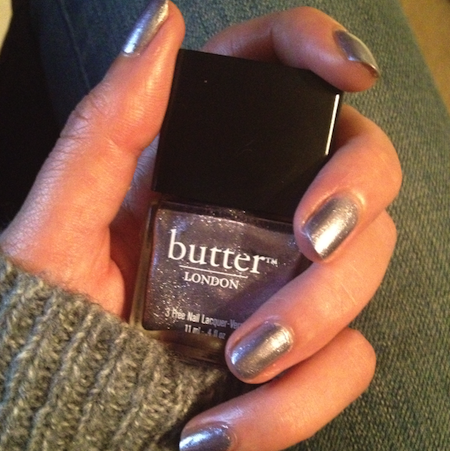 The silvery polish (no real trace of lilac, though it looks lilac in the bottle) added a bit of shine and interest to my gloomy grey jumper and plain jeans. To see the polish “in action”, take a look at the Teen Skincare video here. Next Post Face of the (other) Day..